www.seniorshousingbusiness.com 19 May-June 2018 n Seniors Housing Business expected to pay for itself within 11 years," says McCaw. "Presuming electric costs continue to increase slightly over time, and accounting for the system producing slightly less each year as the panels lose efficiency, I still think the system will save at least $11,000 per year in electric costs when the RECs expire in 2036." McCaw estimates that the pan- els' production ability will dimin- ish by 0.5 percent per year. Sustainability is subjective Constructing sustainable build- ings doesn't always have to be associated with added fees and bureaucracy. Waltham, Massachusetts-based Benchmark Senior Living is the developer, owner and operator of two LEED-certified properties. Bedford Falls in Bedford, New Hampshire, which opened in October 2012 with 84 indepen- dent living apartments, 60 assisted living units and 24 memory care units, is certified LEED Platinum. 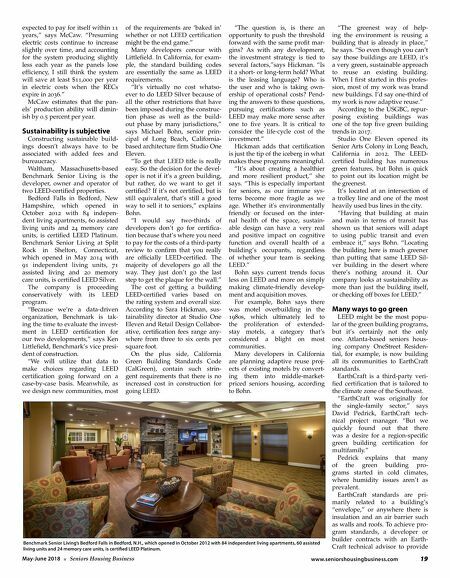 Benchmark Senior Living at Split Rock in Shelton, Connecticut, which opened in May 2014 with 91 independent living units, 71 assisted living and 20 memory care units, is certified LEED Silver. The company is proceeding conservatively with its LEED program. "Because we're a data-driven organization, Benchmark is tak- ing the time to evaluate the invest- ment in LEED certification for our two developments," says Ken Littlefield, Benchmark's vice presi- dent of construction. "We will utilize that data to make choices regarding LEED certification going forward on a case-by-case basis. Meanwhile, as we design new communities, most of the requirements are 'baked in' whether or not LEED certification might be the end game." Many developers concur with Littlefield. In California, for exam- ple, the standard building codes are essentially the same as LEED requirements. "It's virtually no cost whatso- ever to do LEED Silver because of all the other restrictions that have been imposed during the construc- tion phase as well as the build- out phase by many jurisdictions," says Michael Bohn, senior prin- cipal of Long Beach, California- based architecture firm Studio One Eleven. "To get that LEED title is really easy. So the decision for the devel- oper is not if it's a green building, but rather, do we want to get it certified? If it's not certified, but is still equivalent, that's still a good way to sell it to seniors," explains Bohn. "I would say two-thirds of developers don't go for certifica- tion because that's where you need to pay for the costs of a third-party review to confirm that you really are officially LEED-certified. The majority of developers go all the way. They just don't go the last step to get the plaque for the wall." The cost of getting a building LEED-certified varies based on the rating system and overall size. According to Sara Hickman, sus- tainability director at Studio One Eleven and Retail Design Collabor- ative, certification fees range any- where from three to six cents per square foot. On the plus side, California Green Building Standards Code (CalGreen), contain such strin- gent requirements that there is no increased cost in construction for going LEED. "The question is, is there an opportunity to push the threshold forward with the same profit mar- gins? As with any development, the investment strategy is tied to several factors,"says Hickman. "Is it a short- or long-term hold? What is the leasing language? Who is the user and who is taking own- ership of operational costs? Pend- ing the answers to these questions, pursuing certifications such as LEED may make more sense after one to five years. It is critical to consider the life-cycle cost of the investment." Hickman adds that certification is just the tip of the iceberg in what makes these programs meaningful. "It's about creating a healthier and more resilient product," she says. "This is especially important for seniors, as our immune sys- tems become more fragile as we age. Whether it's environmentally friendly or focused on the inter- nal health of the space, sustain- able design can have a very real and positive impact on cognitive function and overall health of a building's occupants, regardless of whether your team is seeking LEED." Bohn says current trends focus less on LEED and more on simply making climate-friendly develop- ment and acquisition moves. For example, Bohn says there was motel overbuilding in the 1980s, which ultimately led to the proliferation of extended- stay motels, a category that's considered a blight on most communities. Many developers in California are planning adaptive reuse proj- ects of existing motels by convert- ing them into middle-market- priced seniors housing, according to Bohn. "The greenest way of help- ing the environment is reusing a building that is already in place," he says. "So even though you can't say those buildings are LEED, it's a very green, sustainable approach to reuse an existing building. When I first started in this profes- sion, most of my work was brand new buildings. I'd say one-third of my work is now adaptive reuse." According to the USGBC, repur- posing existing buildings was one of the top five green building trends in 2017. Studio One Eleven opened its Senior Arts Colony in Long Beach, California in 2012. The LEED- certified building has numerous green features, but Bohn is quick to point out its location might be the greenest. It's located at an intersection of a trolley line and one of the most heavily used bus lines in the city. "Having that building at main and main in terms of transit has shown us that seniors will adapt to using public transit and even embrace it," says Bohn. "Locating the building here is much greener than putting that same LEED Sil- ver building in the desert where there's nothing around it. Our company looks at sustainability as more than just the building itself, or checking off boxes for LEED." Many ways to go green LEED might be the most popu- lar of the green building programs, but it's certainly not the only one. Atlanta-based seniors hous- ing company OneStreet Residen- tial, for example, is now building all its communities to EarthCraft standards. EarthCraft is a third-party veri- fied certification that is tailored to the climate zone of the Southeast. "EarthCraft was originally for the single-family sector," says David Pedrick, EarthCraft tech- nical project manager. 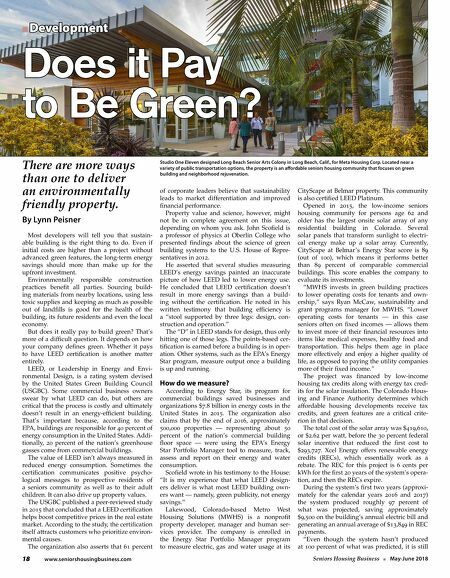 "But we quickly found out that there was a desire for a region-specific green building certification for multifamily." Pedrick explains that many of the green building pro- grams started in cold climates, where humidity issues aren't as prevalent. EarthCraft standards are pri- marily related to a building's "envelope," or anywhere there is insulation and an air barrier such as walls and roofs. To achieve pro- gram standards, a developer or builder contracts with an Earth- Craft technical advisor to provide Benchmark Senior Living's Bedford Falls in Bedford, N.H., which opened in October 2012 with 84 independent living apartments, 60 assisted living units and 24 memory care units, is certified LEED Platinum.